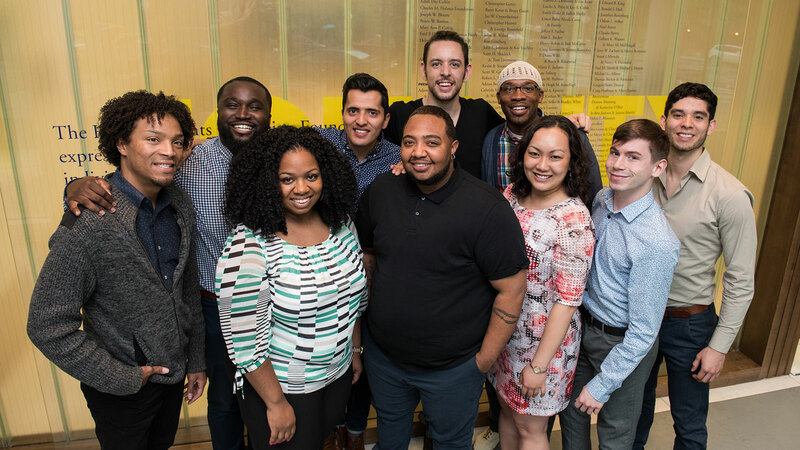 Today, HRC Foundation announced the selection of 10 outstanding, young leaders for the second year of its fellowship program focused on elevating the work of young people on the front lines of the HIV and AIDS epidemic. The HRC Foundation's HIV 360° Fellowship Program, made possible with the generous support of the Elton John AIDS Foundation (EJAF), provides individualized training and support to innovative young professionals and nonprofit leaders as they tackle the challenges facing communities hit hardest by HIV, including Black and Latino gay and bisexual men, transgender women of color, and LGBTQ people living in the U.S. South. Ashley Young of Little Rock is an experienced public health professional whose work is aimed at the improvement of health systems and health outcomes for underserved communities specifically geared towards women and children. Ashley currently serves as the project manager for the Passion Project, a SAMHSA funded initiative designed to expand and enhance substance use disorder treatment, behavioral health, HIV & AIDS, and viral hepatitis services to high risk African-American women who have substance use or co-occurring substance use issues and mental health disorders. Charlie Ferrusi of New York City is an impassioned social justice activist, seeking to eliminate the health disparities faced by LGBTQ people as well as people living with and affected by HIV. Charlie received his MPH in Community Health from New York University College of Global Public Health. He currently serves as a Contract Manager at the NYS Department of Health, AIDS Institute in the LGBT Health Services Unit. Charlie works closely with both the Columbia County Young Democrats and Hudson Pride Foundation. Damon Johnson of Atlanta is a rising public health leader dedicated to transformational social change. Damon currently serves as the Associate Director of Programs at NAESM, Inc., a community-based organization focused on the impact of HIV on communities of color in the South. Damon and his team take a multidisciplinary approach to developing comprehensive programs and initiatives that address the complex needs of people from marginalized communities. Daniel Downer of Orlando is a budding community advocate who firmly believes in fostering unity for everyone regardless of their ethnicity, gender identity, race, or sexual orientation. He currently works as an Early Intervention Specialist for the Hope and Help Center of Central Florida, Inc. Daniel is a well-respected leader in his community for his ability to captivate, empower, inspire, and mobilize others to erase the stigmas not only surrounding HIV, but also ethnic and gender identity, homelessness, mental health and substance abuse, race, and sexual orientation. Daniel Szymczyk of New York City is a graduate of Appalachian State University and a rising, nonprofit professional. He is the founder and Executive Director of The HIV League, the nation's only scholarship-granting organization for students living with HIV. Daniel began focusing his efforts on HIV-related issues once he grew comfortable with his own HIV-positive diagnosis. Erika Usui of New York City is a graduate of the State University of New York Downstate Medical Center’s School of Public Health. Erika currently serves as Health Services Coordinator at The Ali Forney Center, a community-based organization whose mission includes protecting LGBTQ youths from the harms of homelessness. Erika is committed to providing LGBTQ youth with the HIV prevention and treatment tools they need and deserve. Francisco Cortes of Philadelphia is the Youth Program Coordinator at Galaei, a queer Latinx social justice organization based in Philadelphia. Francisco currently serves on the Board of Directors for Juntos, and he is the youngest appointed Commissioner to the Office of LGBT Affairs in the city of Philadelphia. Jalenzski Brown of Dallas seeks to find peace, love, happiness, and understanding in every moment of his human experience and help those around him do the same. Jalenzski studies the world around him, seeking new truths in an effort to create a greater tomorrow. He currently works at Resource Center – North Texas’ primary LGBT and AIDS service organization – as the MPowerment Programs Manager, where co-manages HIV and STD prevention and treatment services. Socorro Moreland of Oakland is a Puerto Rican, classically trained chef who was born in 1985 to a revolutionary family committed to social justice liberation and the Black power movement. Socorro found his calling within the HIV prevention field 11 years ago and coordinates programming and support services for transgender people of color within the Bay Area. Socorro currently works for APEB, a community-based, nonprofit organization. William Campillo Terrazas of Little Rock was born in Nogales, Sonora, Mexico and migrated to the United States at the age of 6. Upon receiving Deferred Action for Childhood Arrivals, William took a job as a Disease Intervention Specialist within the Arkansas Department of Health. In 2015, William helped co-found Latinxs Revolucion LGBTQ, a queer- and trans-led, community-based organization in Little Rock that focuses on the health and well-being of Latinx immigrants. The new class of fellows will receive leadership and organizational development training, mentorship, as well as coaching in communications, leadership, fundraising, and other aspects of successful nonprofit management – all focused on strengthening their own community-based organizations and initiatives. Members of last year’s inaugural fellowship class developed their non-profit management and leadership skills, and received a grant of up to $9,000 to design, implement, and evaluate innovative approaches to addressing the HIV and AIDS epidemic in their local communities. You can read more about their projects here. To date, the 2016 cohort’s efforts have helped more than 1000 LGBTQ people and allies access HIV-related programs and services in some of the nation’s hardest hit communities. Since its founding, HRC has worked to end the dual epidemics of HIV and HIV-related stigma through federal, state and local advocacy as well as public education and outreach. By educating LGBTQ people and allies about the current realities of HIV, HRC has been able to mobilize its members and supporters to take action to support critical public health programs like the Ryan White Care Program, and to expand access to vital health care, treatment, and nondiscrimination protections made possible by the Affordable Care Act. HRC has also worked with various public health organizations to raise awareness of and increase access to Pre-Exposure Prophylaxis (PrEP) in communities across the nation hardest hit by HIV. HRC also regularly trains healthcare providers, front line workers, and community advocates on how to best provide LGBTQ-competent, HIV-inclusive care to the people most in need, especially those living throughout the Deep South. For more information about the program, please visit: www.hrc.org/hiv360.